SCOTTSDALE, AZ--(Marketwired - Jan 14, 2014) - TASER International (NASDAQ: TASR) today announced that the United States District Court for the District of Delaware entered a final judgment on January 10, 2014 in the patent infringement litigation entitled TASER International v. Karbon Arms, LLC awarding TASER a permanent injunction. The Court's final judgment decreed that Karbon Arms' MPID and MPID-C conducted electrical weapons infringe TASER's U.S. Patent Numbers 6,999,295; 7,782,592 and 7,800,885. The Court further decreed that the above referenced TASER patents are valid and enforceable and awarded TASER $2,385,366 in damages for infringement. The permanent injunction restrains and enjoins Karbon Arms and its current and former officers, agents, directors, employees, and affiliates and those persons in participation with them who receive actual notice of the injunction from making, using, offering to sell or selling the Karbon Arms MPID and MPID-C or supplying a substantial portion of the components that are used in the Karbon Arms devices. The permanent injunction requires Karbon Arms to send written notice of the injunction to each distributor, dealer, sales representative, certified MPID or MPID-C instructor or armorer within 30 days of January 10, 2014. "TASER aggressively pursues any infringement of its extensive patent and intellectual property portfolio and is very pleased that the U.S. District Court entered a permanent injunction and judgment against Karbon Arms for infringement of TASER's patents," said Doug Klint, TASER's President and General Counsel. "This final judgment brings to a close more than six years of various patent litigations between TASER and Karbon Arms and Karbon Arms' predecessor company Stinger Systems, Inc. The Court's order requires Karbon Arms to provide TASER a list of customers who purchased a Karbon Arms MPID or MPID-C within three business days of January 10, 2014 and TASER will be sending notice of the permanent injunction to all such Karbon Arms customers. The company is evaluating the collectability of the judgment," concluded Klint. TASER protects life: TASER Conducted Electrical Weapons (CEWs) have saved more than 119,000 lives from potential death or serious injury. TASER protects truth: We enable greater transparency with the industry-leading TASER CAM and AXON on-officer video systems. Together with our customers, we are defining the future of smart policing by connecting intelligent devices and sensors with the first secure cloud-based digital evidence management solution for law enforcement: EVIDENCE.com. Since 1994, more than 260,000 private individuals have relied on TASER technology to protect themselves and their loved ones. Learn more about TASER and its solutions at www.TASER.com and www.EVIDENCE.com or by calling (800) 978-2737. TASER® is a registered trademark of TASER International, Inc., registered in the U.S. All rights reserved. TASER logo, TASER CAM, and AXON are trademarks of TASER International, Inc. Please visit http://investor.taser.com, http://blog.taser.com, www.twitter.com/taser_ir www.twitter.com/officialtaser, and https://www.facebook.com/TASER.International where TASER discloses information from time to time about the company, its financial information, and its business. 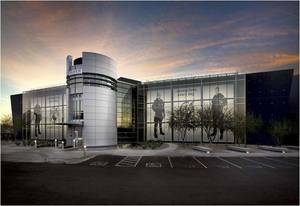 TASER International's HQ in Scottsdale, AZ. TASER as a technology solutions provider with its TASER Smart Weapons have saved more than 119,000 lives from potential death or serious injury. Photo courtesy of TASER International, Scottsdale, Arizona USA.